WhatsApp World is the largest messaging app. Whatsapp is the most preferred platform for smartphone users. It has been made available in many languages. There are over 20 million active users on WhatsApp. In such cases, if users want to use it in their preferred language, then they can. Let us know that WhatsApp can be used in Hindi, Bengali, Punjabi, Telugu, Marathi, Tamil, Urdu, Gujarati, Kannada and Malayalam. Step 1. Open WhatsApp and click on the three dots given in the top right corner. Must Read: How Can I Download and Save WhatsApp Status Video to Galary? Step 2. This will open settings. Step 3. After selecting the settings, select Chat and go to App Language. Step 4. Now choose the language of your choice. As if I had to choose Hindi language then I touched on Hindi language. Also, let us know one thing that WhatsApp supports the language that will be the default language of the smartphone. In such a case, if you want, you can change the language of the phone by changing the language of the phone. Do this in a situation when you also need to change the phone language. Step 1. First of all, you will need to tap Language and Input in the settings of the phone. Step 2. Then choose your favorite language from here. Step 3. Now open WhatsApp and here you will see app text in the same language that you have chosen. Step 1. Open the phone’s settings. Step 2. Then tap on General. Step 3. Now in Language & Region, tap on iPhone Language. Step 4. From here you will be able to choose your favorite language. Step 5. Now WhatsApp will show you in the same language that you have chosen. 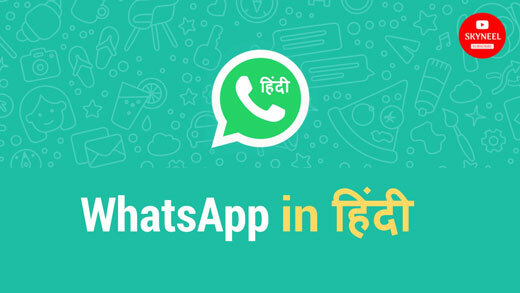 With the help of this article, you can use WhatsApp in Hindi. If you liked this article then you can also like our Facebook page and subscribe to our YouTube channel too. If you have any problem related to this article, you can comment and tell us.